These Umbrellas are large Garden Umbrellas, standard size is 6ft diameter. Generally these Umbrellas are used for decoration and as Sun shades in garden parties and events. They come in a variety of colors, with hand patch work, thread work and Mirror embroidery on both the Interior and exterior of the Umbrellas. They not only look beautiful but they also provide the much needed shade from the sun, being in two layers, they give you the best protection and shade. Are you planning to host an outdoor party, function or a family picnic ? Our Garden Umbrellas are the best and quickest solution for shade from the scorching Sun. The craze of using colorful and decorated Garden Umbrellas in catching up in many open restaurants, cafes, lounges, terrace gardens and similar high end places. We also provide iron stands to fix these Umbrellas on concrete floors. We also make Party Umbrellas in Silk with Lace and decoration. We only make heavy duty Applique Work Garden Umbrellas, using the best quality fabrics and heavy frames. Our Umbrellas will surely last for a very long time, as compared to others. 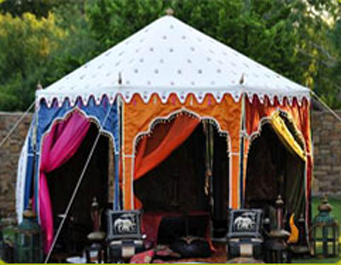 We are the Leading Garden Umbrellas Manufacturer in Delhi, providing you the best quality in the most competitive rates. 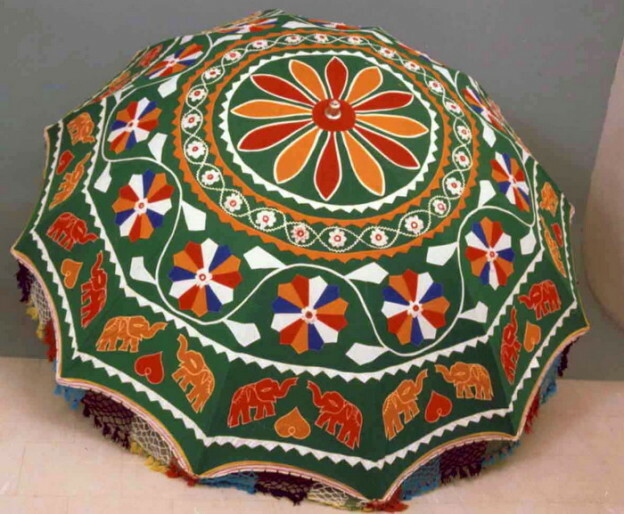 We are patronizing this amazing handicraft of making Applique Work Umbrellas by hand.